Note. The last of the Witmark demos to be recorded in the Witmark Studio. Mono studio recordings, 6 minutes. 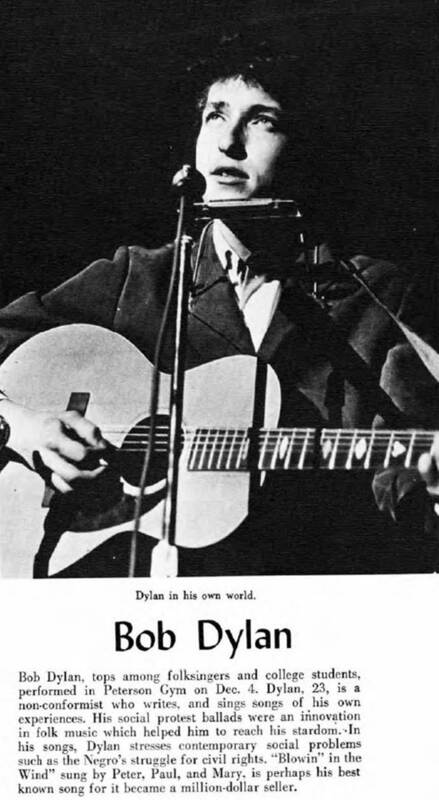 Bob Dylan (guitar and vocal). 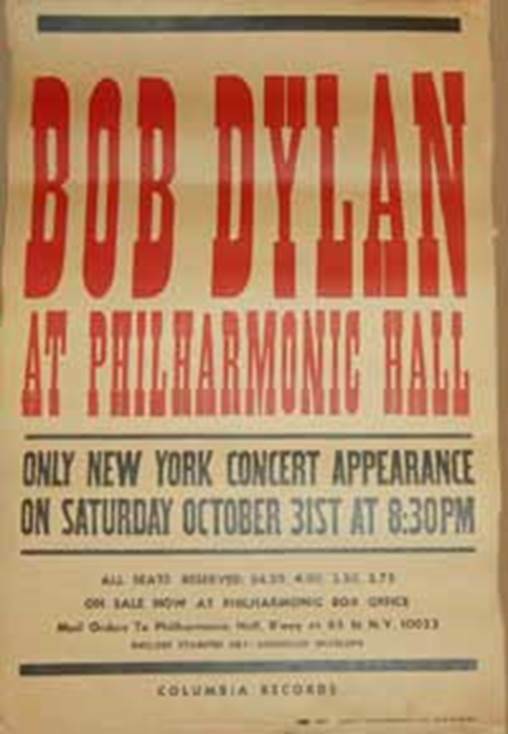 1-4, 6 Bob Dylan (harmonica). The DVD Bootleg Series,Vol 1. 1-3, 5, 6 released on 50th ANNIVERSARY COLLECTION (1964), LP 1, side A, 8 December 2014. 4 and fragment of 5 released on the DVD No Direction Home. A Film by Martin Scorsese, Paramount Pictures, 3 October 2005. Fragment of 1, 5 released in THE BEATLES ANTHOLOGY, Volume 4, video and DVD, 1996. Fragment of 5 released in DVD JOHN HAMMOND - FROM BESSIE SMITH TO BRUCE SPRINGSTEEN, 19 September 1990. 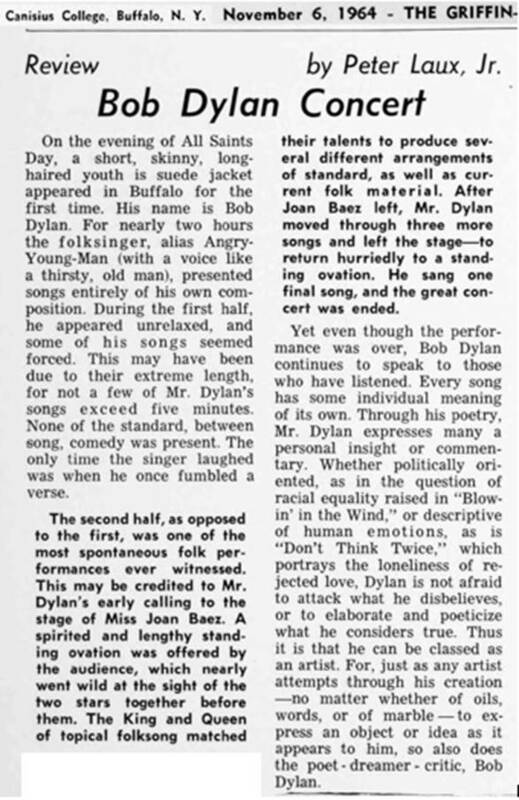 BOB DYLAN 50th ANNIVERSARY COLLECTION 1964. Review by Derek Barker. Isis # 178 pp 44-47. 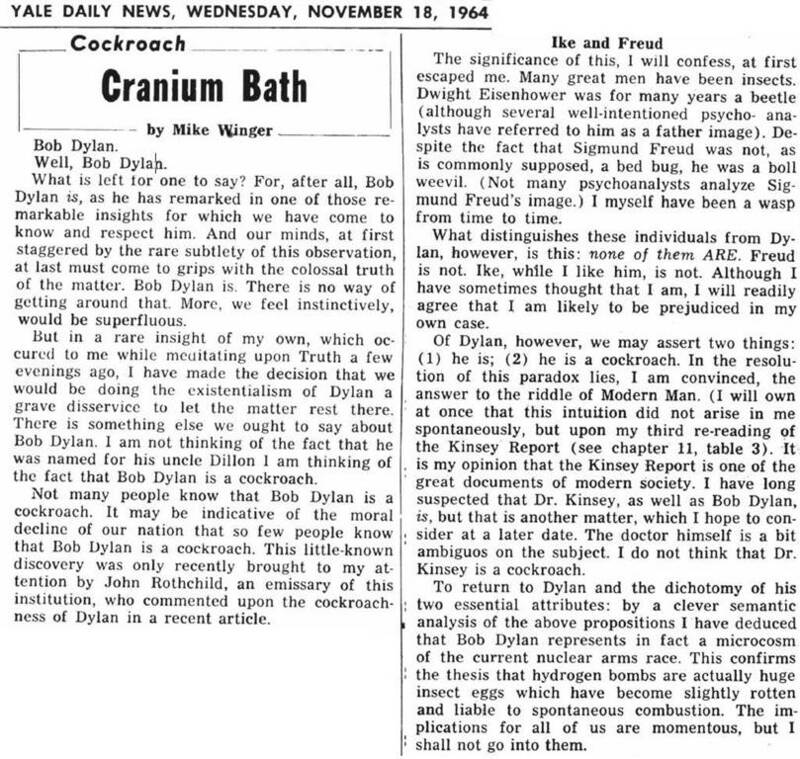 Aired by the Canadian Broadcasting Corporation (CBC) 10 March 1964 in the program series Quest. This show was called The Times They Are A-Changin'. Mono TV broadcast, 30 minutes. Session info updated 10 October 2015. 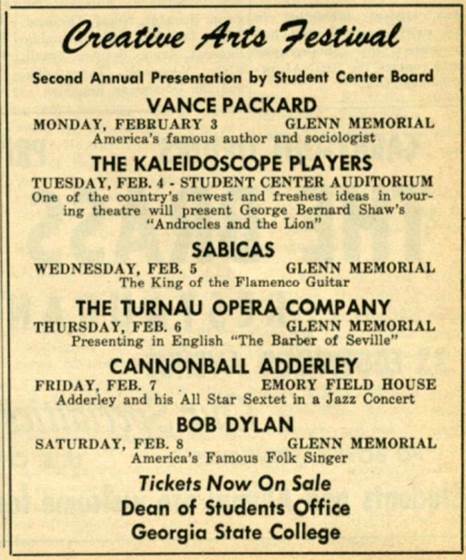 There is no available recording or known set-list from this concert. 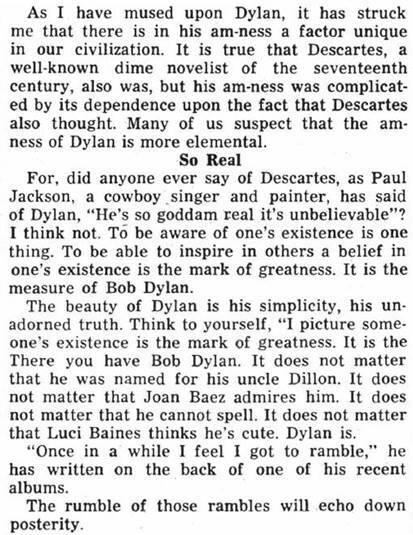 Bob Spitz: Dylan – A Biography, page 257. Session info created 7 January 2019. Session info created 21 January 2019. 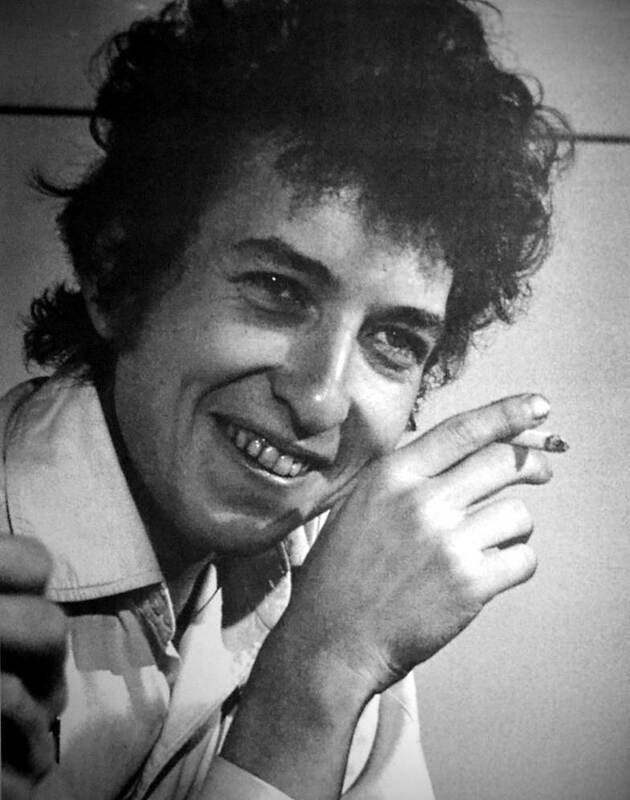 Bob Dylan (guitar, harmonica and vocal). 9, 10 Joan Baez (guitar and vocal). There is no available recording from this concert. The Magazine of UC Riverside. Session info created 8 January 2019. The song and interview available on Dont Look Back outtakes and More. Released on 50th ANNIVERSARY COLLECTION (1964), LP 1, side B, 8 December 2014. 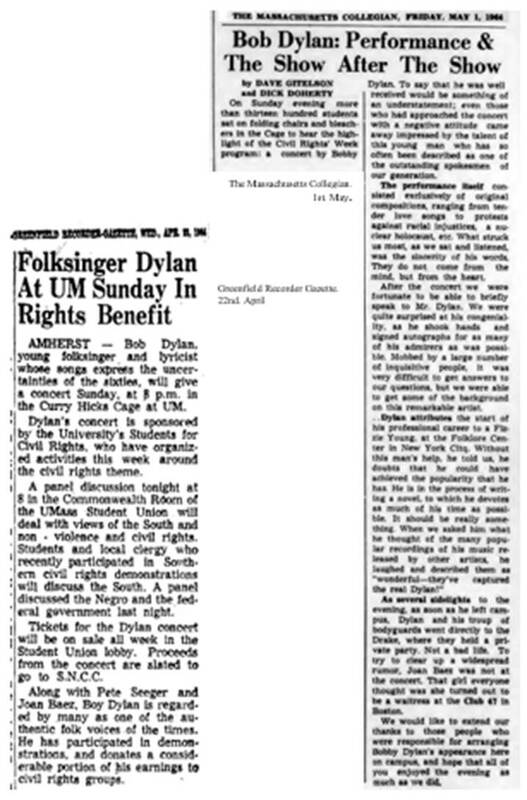 The song was available on bobdylan.com from July 2008. 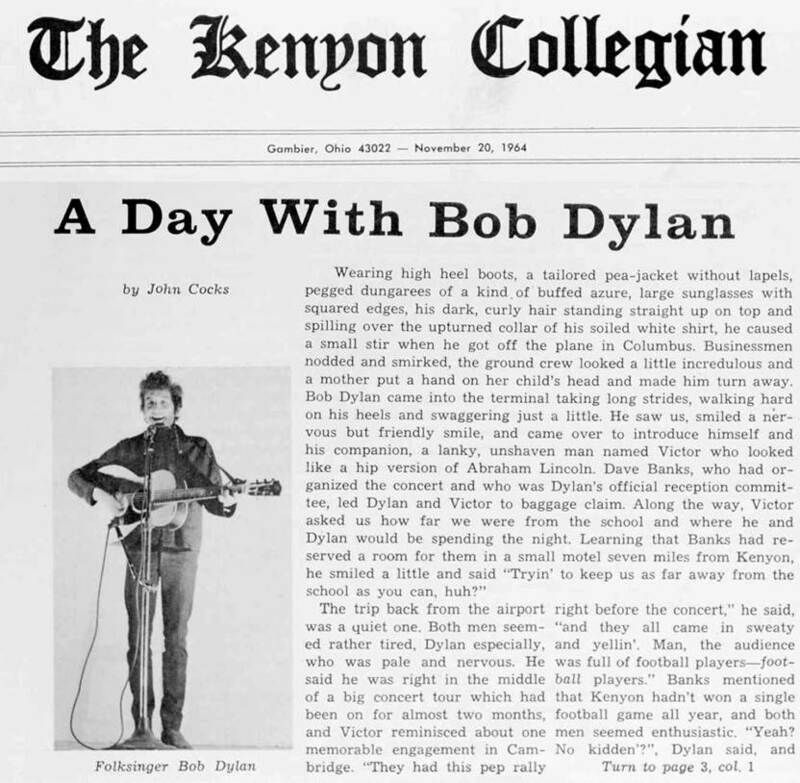 The circulating TV recording includes a chat between Bob Dylan and Steve Allen. Mono TV broadcast, 13 minutes, track 1 is 6 minutes. 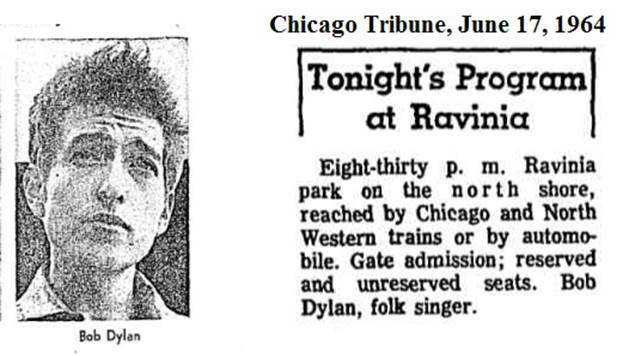 Bob Dylan: Known & Rumoured Appearances. (Not in general circulation). Blues Project recording session produced by Paul A. Rotchild & Jac Hilzman. Geoff Muldaur (vocal and guitar), Fritz Richmond (bass), John Sebastian (harmonica), Eric von Schmidt (piano), Bob Dylan (piano). Released on Various Artists: Blues Project, Elektra EKL 264, June 1964. Note. 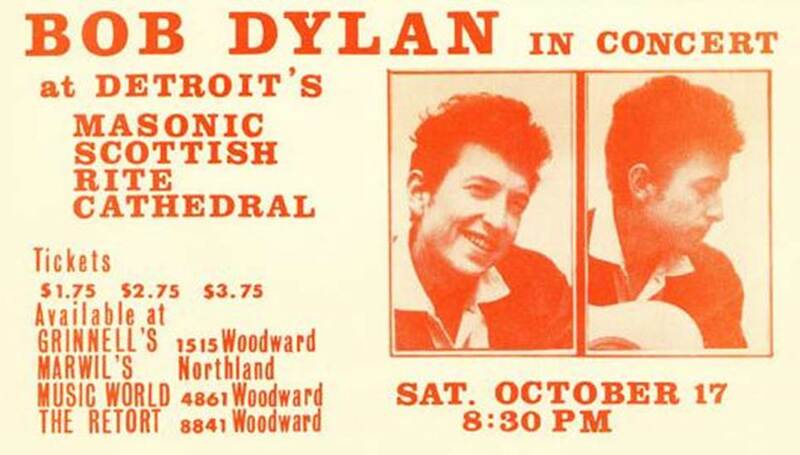 Bob Dylan appears as “Bob Landy”. Session info updated 9 February 2019. Session info created 9 January 2019. 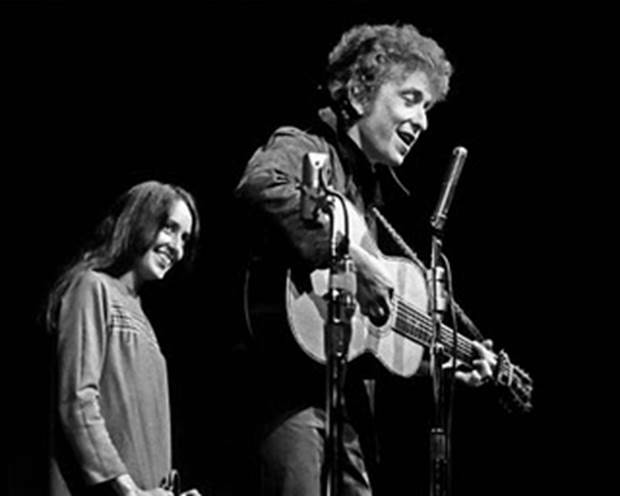 Joan Baez (vocal & guitar), Bob Dylan (guitar, vocal). There is no circulating recording from this date. 2 Folksingers Entertain At White Plains by Frank Reagan, The Daily News, Tarrytown, New York. 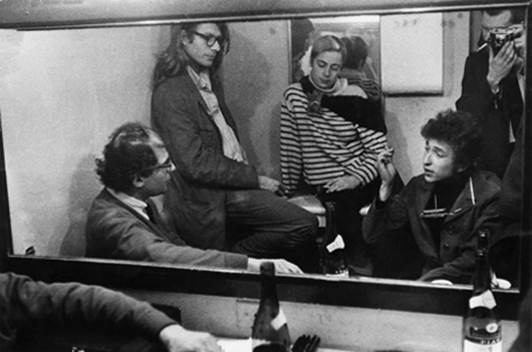 Bob Dylan (guitar, vocal, harmonica), Eric von Schmidt ((guitar, vocal, harmonica). Released on 50th ANNIVERSARY COLLECTION (1964), LP 1, side B & LP 2, 8 December 2014. 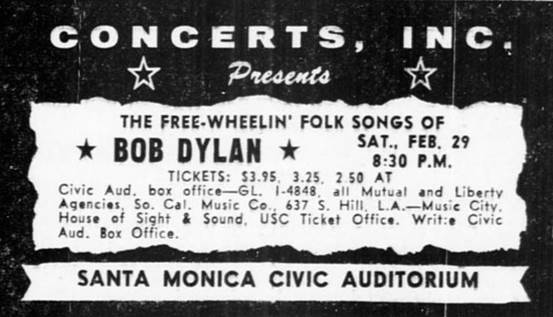 First known recording of Mr. Tambourine Man. Walkin’ Down The Line contains the lyrics I Want To Hold Your Hand. Session info updated 17 March 2015. Released in the UK on Bob Dylan Transmissions, Storming Music Company, SMC 2520, 3 December 2007. Released on 50th ANNIVERSARY COLLECTION (1964), LP 2, side D, 8 December 2014. Fragment of 1 released on the DVD NO DIRECTION HOME, October 2005. Broadcast by BBC 1 12 May 1964 in the program Tonight introduced by Cliff Mitchelmore. The first re-broadcast was by Swedish TV1, 21 February 1983. The first complete UK repeat was by BBC2-TV, 18 September 1987 in the documentary Getting To Dylan, one in the Omnibus series. Mono TV broadcast, 3 minutes. 1 released on 50th ANNIVERSARY COLLECTION (1964), LP 2, side D, 8 December 2014. Probably filmed for the ATV programme Hallelujah, but never broadcast. Only the first track circulates, the other two tracks are probably erased. Live debut of Chimes Of Freedom. 1 mono studio recording, 3 minutes. 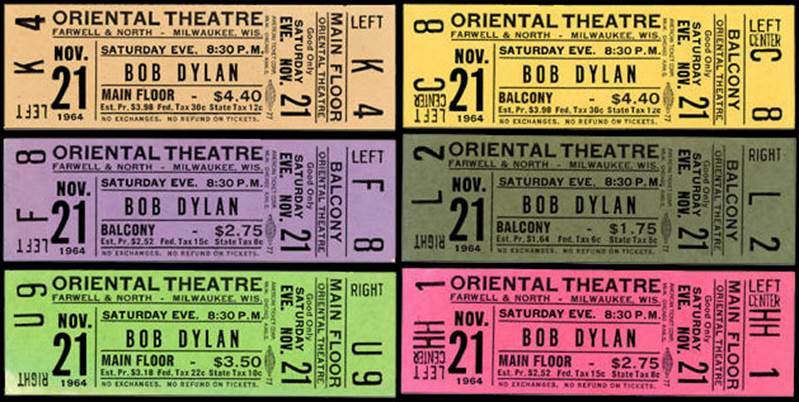 1, 2, 4, 6-10, 12-18 Bob Dylan (harmonica). Released on 50th ANNIVERSARY COLLECTION (1964), LP 3 & 4, 8 December 2014. 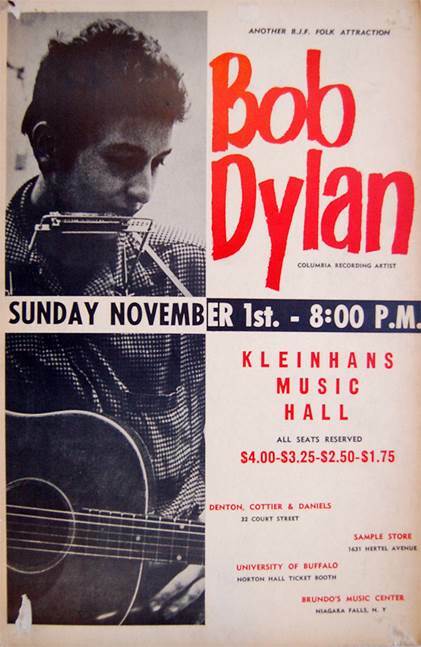 For more information about “Bob Dylan In Concert” please go to http://www.searchingforagem.com/1960s/1964InConcert.htm. This concert was recorded by Pye Records Ltd. 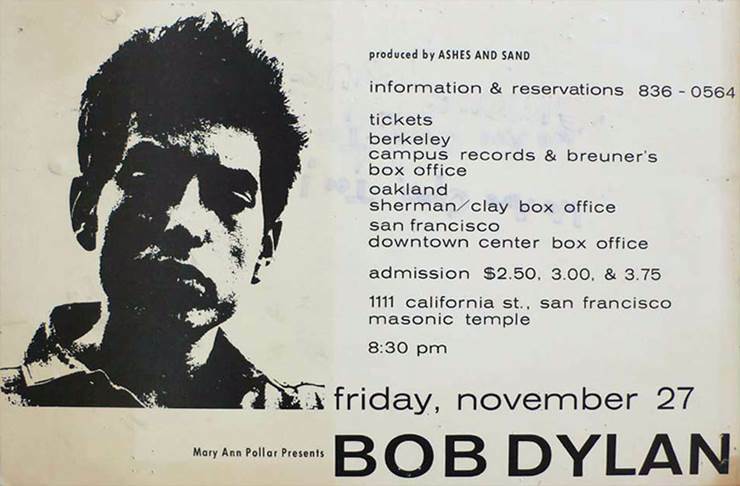 Tracks 9 and 10 were both intended for the “Bob Dylan In Concert” project. 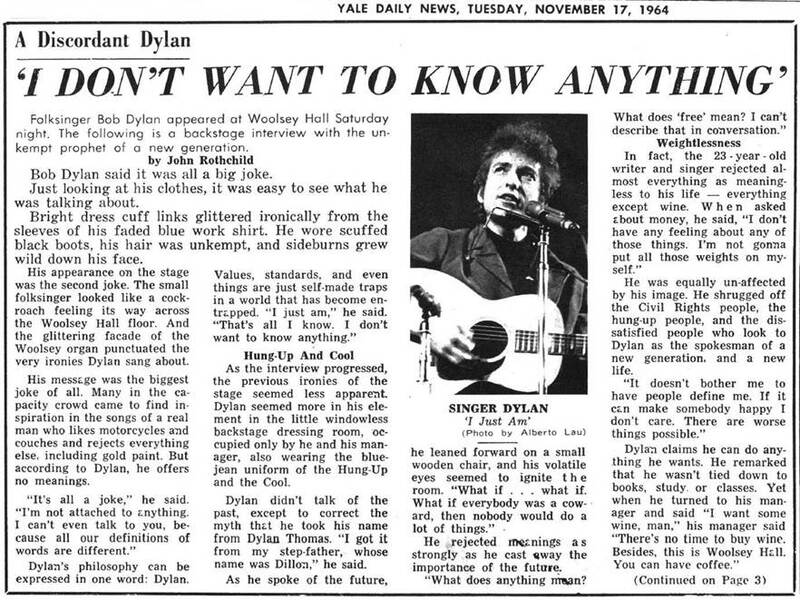 Probably the live debuts of Mr. Tambourine Man and It Ain’t Me, Babe. Mono PA recording, 95 minutes. 1-4, 37-39 Bob Dylan piano. 34, 35 ”Rambling” Jack Elliott (backup vocal). 1, 5, 10, 11, 14, 18, 20, 23, 25, 34, 37, 38, 40-43 released on 50th ANNIVERSARY COLLECTION (1964), LP 5, 8 December 2014. 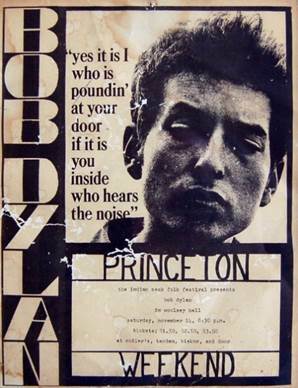 6, 7, 12, 17, 22, 29, 33, 36, 39, 43 edited with 44, 47 released on ANOTHER SIDE OF BOB DYLAN, Columbia CL–2193, CS–8993, 8 August 1964. 6, 7, 12, 17, 22, 29, 33, 36, 39, 43 edited with 44, 47 released in mono as part of the CD box BOB DYLAN THE ORIGINAL MONO RECORDINGS, Columbia MONO–88697761042, 18 October 2010. 6, 7, 12, 17, 22, 29, 33, 36, 39, 43 edited with 44, 47 released in remastered versions on the CD/SACD ANOTHER SIDE OF BOB DYLAN, Columbia 512354-6 as part of the CD box BOB DYLAN REVISITED, THE REISSUE SERIES, 24 March 2004. 6, 7, 12, 17, 22, 29, 33, 36, 39, 43 edited with 44, 47 released in remastered versions on ANOTHER SIDE OF BOB DYLAN, Columbia 88691924312-04 as part of the CD box THE COMPLETE ALBUM COLLECTION, VOL. ONE, 5 November 2013. 6, 36, 47 released on 3 CD box set DYLAN, Columbia 88697114202-D1, 1 October 2007. 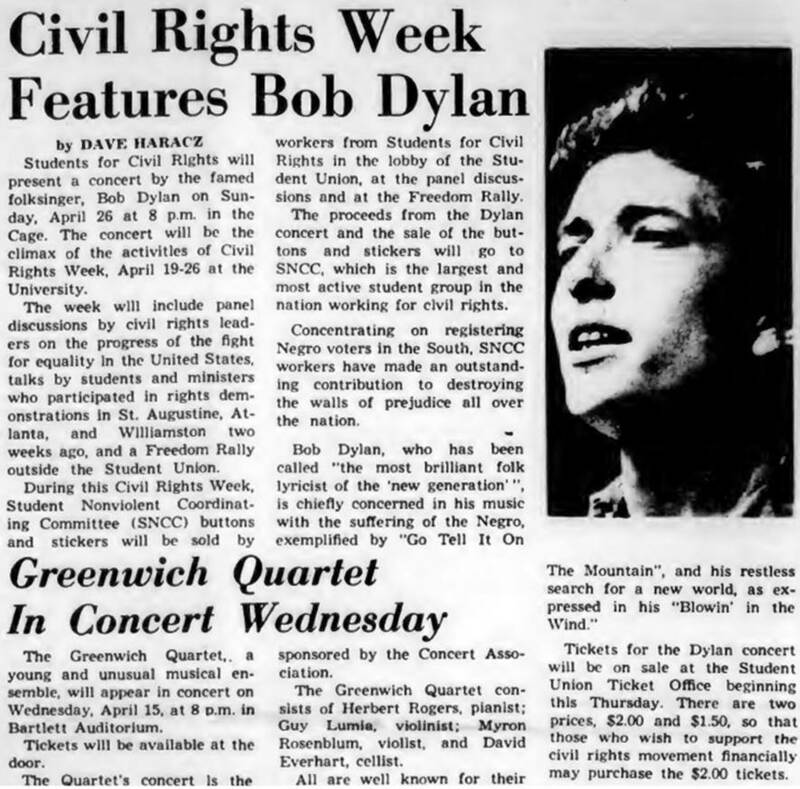 6 released on BOB DYLAN'S GREATEST HITS, Columbia KCL–2663, 27 March 1967. 6 released on MASTERPIECES, CBS/SONY 57 AP875–7, March 1978 in Japan, and later 1978 in Australia and New Zealand. 6, 7 released on BIOGRAPH, Columbia C5X & C3K 38830, 28 October 1985. 6 released in Sweden on THE VERY BEST OF BOB DYLAN, Columbia COL 498540 2, 5 May 2000. 6 released in the UK on THE ESSENTIAL BOB DYLAN, Columbia C2K 85168, 31 October 2000. 6, 7 released in the UK on BEYOND HERE LIES NOTHIN’, Sony Music 8 86979 83862, 24 October 2011. 6 released on THE BEST OF BOB DYLAN VOL 2, Columbia COL 498361 9, 8 May 2000. 7 released on single CBS 2921, August 1967 in Benelux, Europe. 7 released on LOVESICK, Victoria’s Secret Exclusive, Sony Music A 72812, 2004. Part of 35 (67 seconds) and 40 or 41 or 42 released on Interactive Music CD–ROM Highway 61 Interactive, Columbia/Graphix Zone CDAC 085700, February 1995. 35 released on THE BOOTLEG SERIES VOL 7. NO DIRECTION HOME: THE SOUNDTRACK, Columbia Legacy CD 520358 2, 30 August 2005. 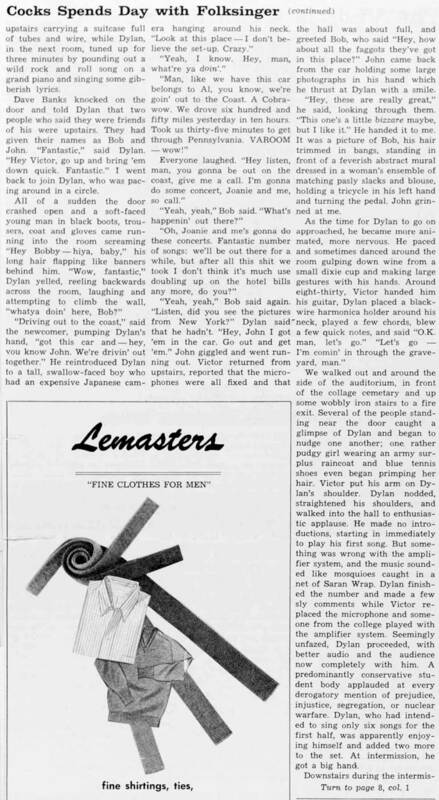 36, 47 released on BOB DYLAN'S GREATEST HITS, VOL. 2, Columbia KG–31120, 17 November 1971. 36 released on DYLAN ON DYLAN, Westwood One (Radio Station Discs), 17 November 1984. 45 released on THE BOOTLEG SERIES (RARE & UNRELEASED) 1961–1991, Volume 2, Columbia 468 086 2, 26 March 1991. · 2, 3 and 4 are composites. · 17 has an insert which makes take 1 complete. · 44 has an insert which makes take 1 complete. · 8, 9, 13, 19, 21, 24, 26-28, 30-32, 34, 41-43, 46 are all false starts. · 5, 14, 15, 23, 25, 37, 40 are interrupted. · 1, 5-7, 10-12, 14, 17, 18, 20-23, 25, 29, 33-45, 47 are in circulation. · 1-4 Denise, Denise, Denise ? on recording sheet. · 5, 6 Candy on recording sheet. · 7 Ramona on recording sheet. · 13-17 Poem 1 crossed over and replaced by Last Thoughts On Woody Guthrie (!) on recording sheet. · 30-33 Motor Psycho on recording sheet. · 34-35 Tambourine Man on recording sheet. · 37 Weird Consumption on recording sheet. · 45 Mamma, You’ve Been On My Mind on recording sheet. · 46, 47 Ancient Memories on recording sheet. · 45 was used as a Witmark & Sons demo. · 22, 29, 33, 35, 36, 39, 43 are part of the Emmett Grogan acetates. Michael Krogsgaard: Bob Dylan: The Recording Sessions (Part 1). The Telegraph #52, Summer 1995, pp. 98–101. 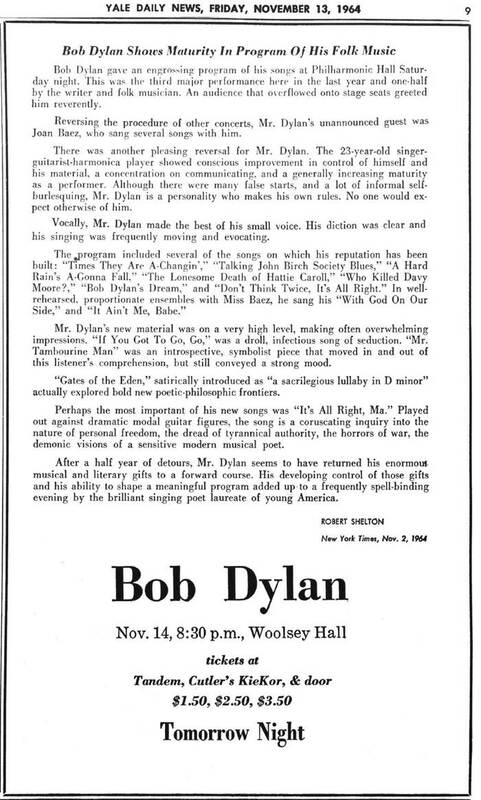 Clinton Heylin: Bob Dylan. The Recording Sessions [1960 – 1994]. St. Martin’s Press December 1995, pp. 29–32. Session info updated 9 April 2015. Note. The last recorded Witmark demos. 3 released on WARNER BROS. 7 ARTS MUSIC INC. DEMO LP, XTV 221567, probably 1967. Mono studio recordings, 12 minutes. 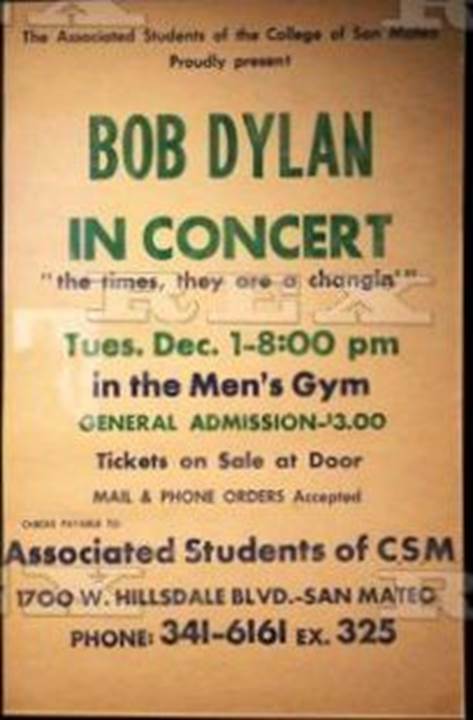 There is no available recording or complete set-list from this concert. First live performance of To Ramona. 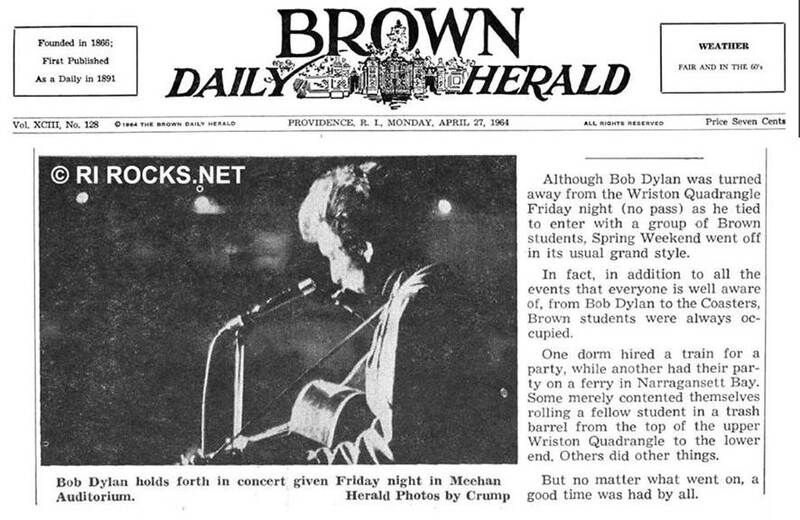 Only known live performance of Ballad In Plain D.
Bob‘s performance probably didn‘t start until about 1:30. This session took place Friday Morning/Afternoon 10:00 AM to 1:30 PM. 1 released on 50th ANNIVERSARY COLLECTION (1964), LP 6, side K, 8 December 2014. 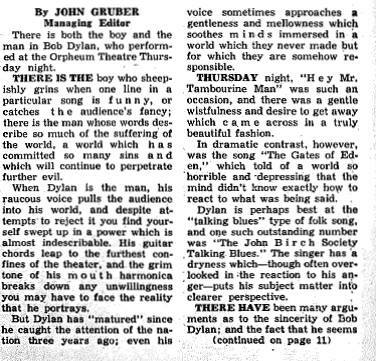 2 partially released in an unacknowledged way in the documentary FESTIVAL, 1967. 3 is not in general circulation. Liner notes to the bootleg Through The Looking Glass translated from an article written for the Spanish fanzine Desolation Post, issue #10, November 2009 by Luis Borrego Polanco. Private communication from Cory Markoff. 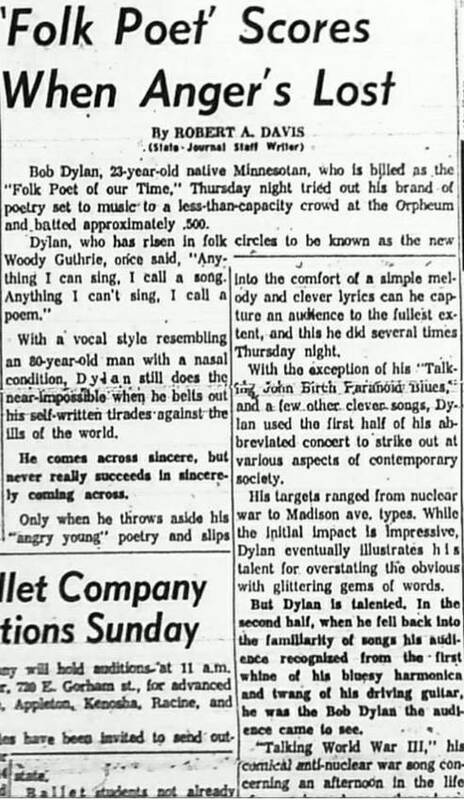 Newport Daily News 23 July 1964. Session info updated 8 November 2016. Joan Baez (vocal & guitar), Bob Dylan (guitar, harmonica, vocal). This session took place Friday Evening 8:00 PM to 10:30 PM. Partially released on the DVD THE OTHER SIDE OF THE MIRROR. LIVE AT THE NEWPORT FOLK FESTIVAL 1963-1965, Columbia 88697144669, 29 October 2007. Released on Joan Baez Live at Newport, Vanguard VAN0077015-2, November 1996. NO DIRECTION HOME, October 2005. Fragment of 1 released on the DVD JOAN BAEZ - HOW SWEET THE SOUND, 30 October 2009. · This session took place Sunday Evening 8:00 PM to 10:30 PM. · Complete version of 1 is part of the Emmett Grogan acetates. 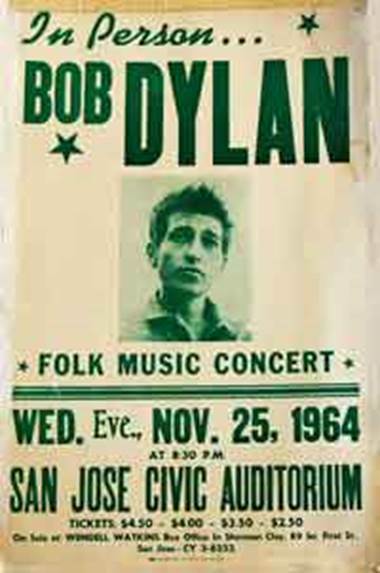 · The footage in the film FESTIVAL combines recordings of All I Really Want To Do from Newport Folk Festival 1965, workshop 24 July! Folk Rogue. Wild Wolf 6965. From Newport To The Ancient Empty Streets Of L.A. Dandelion DL 061/62. 1, 2 released on 50th ANNIVERSARY COLLECTION (1964), LP 6, side K, December 2014. 1 partly released in the movie FESTIVAL, 1967. 3 released in mp3 format on the download-only three-track single EXCLUSIVE OUTTAKES FROM NO DIRECTION HOME: THE SOUNDTRACK, Columbia, 1 November 2005. 3 digitally released on the iTunes collection RARE TRACKS FROM THE VAULTS, 29 August 2006. 4 released on the DVD No Direction Home. A Film by Martin Scorsese, Paramount Pictures, 3 October 2005. 4 released on THE BOOTLEG SERIES VOL 7. NO DIRECTION HOME: THE SOUNDTRACK, Columbia Legacy CD THE OTHER SIDE OF THE MIRROR. 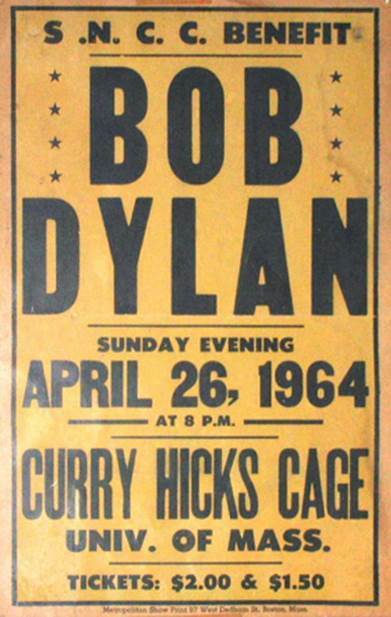 LIVE AT THE NEWPORT FOLK FESTIVAL 1963-1965, Columbia 88697144669, 29 October 2007. 5 released on Joan Baez Live at Newport, Vanguard VAN0077015-2, November 1996. 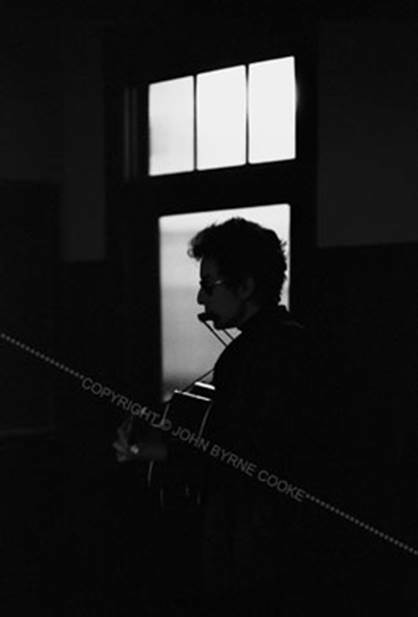 Michael Krogsgaard: Bob Dylan In Concert, On The Tracks, Volume 4, No. 1, page 51. 1-5 stereo PA recordings, 20 minutes. Joan Baez concert at The Forest Hills Music Festival. 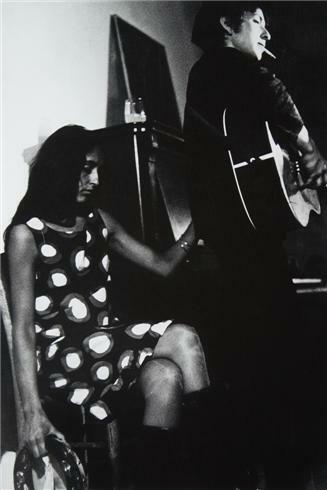 Bob Dylan and Joan Baez (guitar and vocal). Released on 50th ANNIVERSARY COLLECTION (1964), LP 6, side K, 8 December 2014. Mono PA recording, 15 minutes. ISIS Magazine, Issue 52, New Year 1994. ISIS Magazine, Issue 97, June / July 2001. Session info created 13 January 2019. Monterey Session info created 13 January 2019. 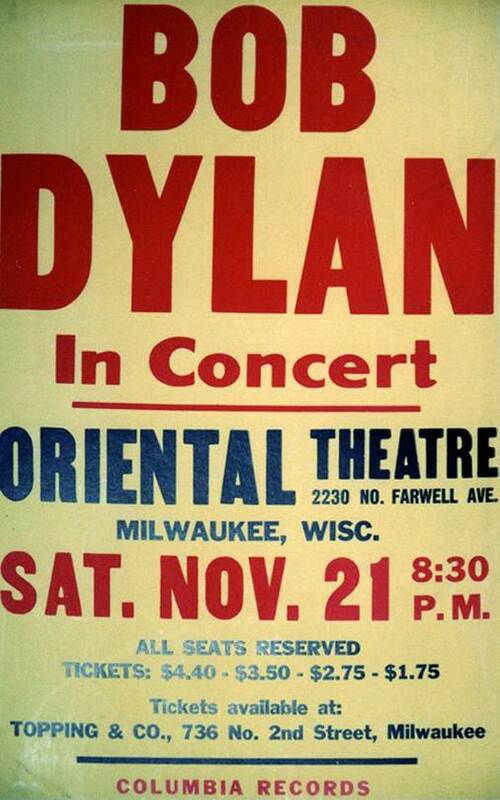 Bob Dylan was a special guest at this Joan Baez concert. This was a benefit concert for Pioneer House, a new inter-racial, non-profit nursery school in Seaside. 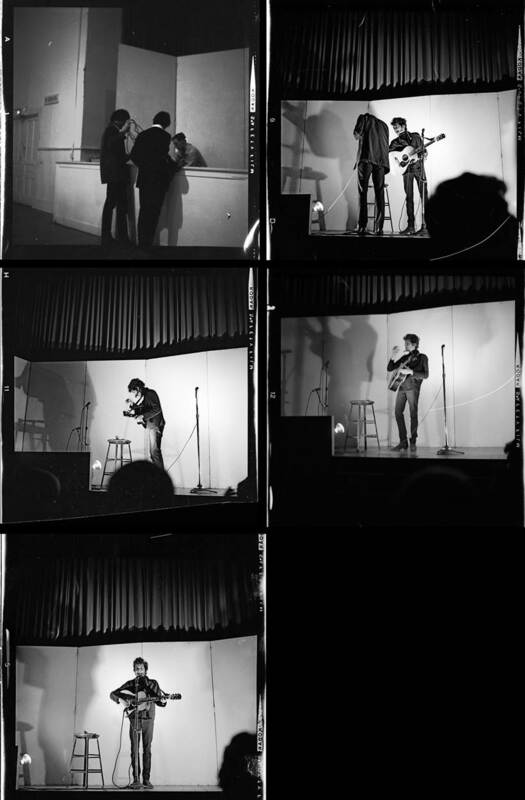 Joan Baez and Bob Dylan performing at the Monterey County Fairgrounds on Sept. 4, 1964. 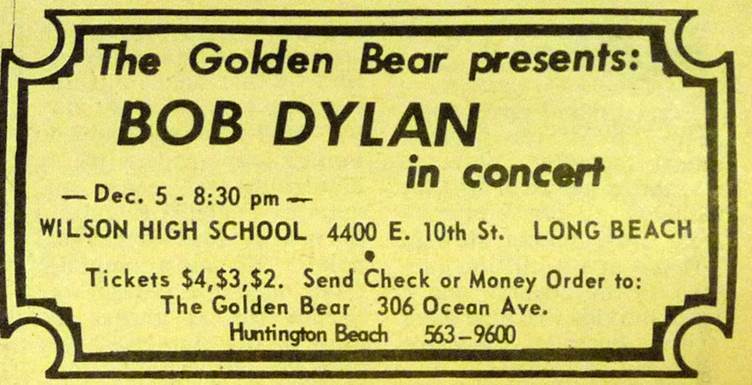 According to a Herald article, Joan Baez was doing a benefit concert for Pioneer House, a new inter-racial, non-profit nursery school in Seaside. 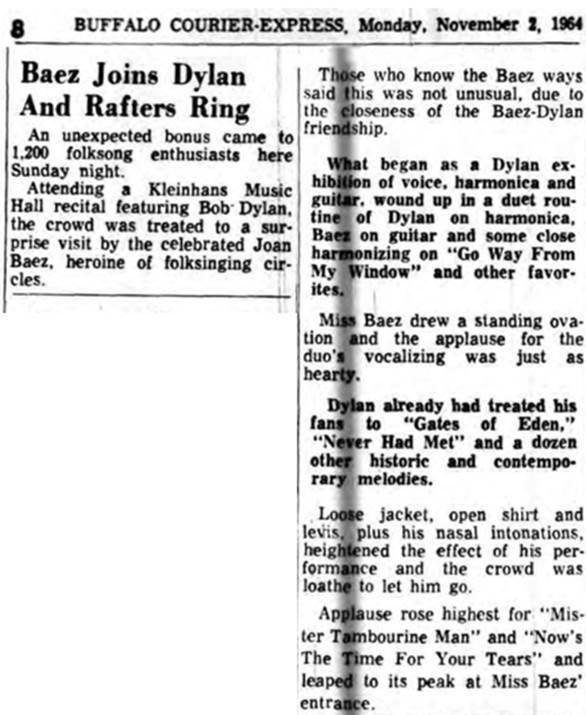 Bob Dylan was a special guest of Baez. 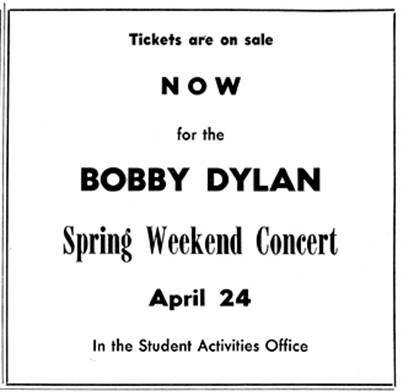 The concert was on a Saturday night and raised about $5,000 for the school. I attended the concert with a delightful girl from Santa Catalina School. She was a big Dylan fan, but I had only heard him on records. I told her that I thought he sounded like a cat being drawn through a wringer, an observation that did not please her. 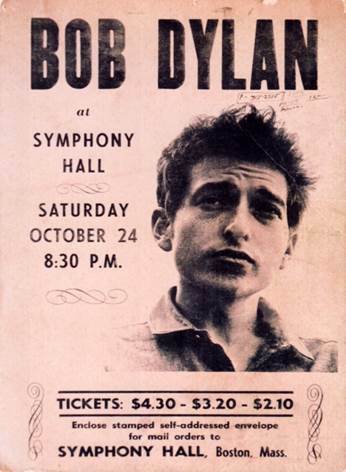 He mumbled his way through a few songs that night, giving a convincing imitation of Marlon Brando. A funny incident occurred while Joan was singing: the PA system went out. She was flummoxed for a moment and shouted, "What shall I do?" Someone shouted back: "Dance!" With a broad smile, she broke into a buck-and-wing, which earned her great applause and much affection. Session info updated 18 September 2015. Michigan Today Article 23 September 2014. Released on 50th ANNIVERSARY COLLECTION (1964), LP 6-8, 8 December 2014. 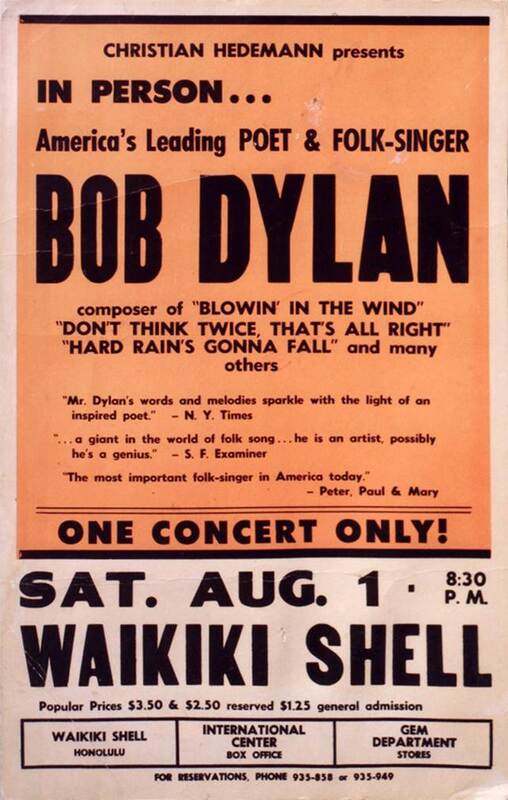 This concert was earlier dated June, July or late September1964. Mono audience recording, 120 minutes. Note. No known tape or set list. Session info updated 11 February 2008. 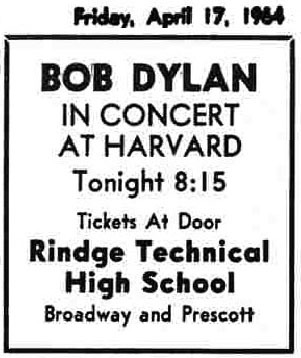 There is no known recording from this concert. 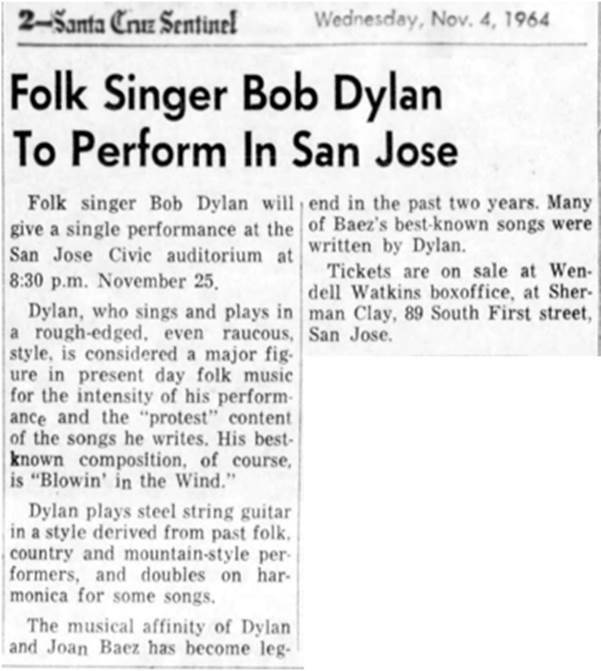 Information originally posted on rec.music dylan 10 December 1994 by jfryblair@aol.com (JfryBlair). Session info updated 13 January 2019. 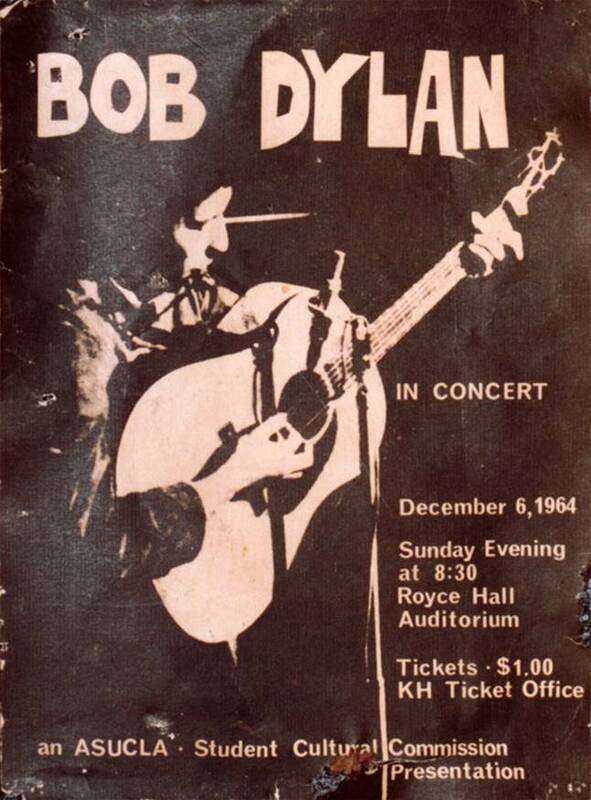 1-15, 17-19 Bob Dylan (vocal & guitar). 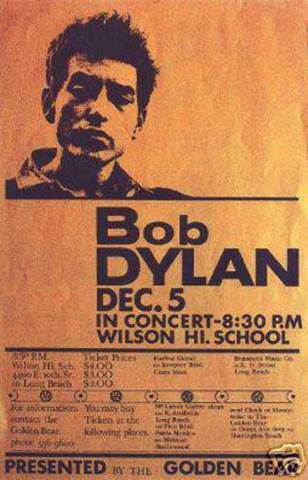 1-4, 6-10, 12-14, 16-18 Bob Dylan harmonica. 15-18 Joan Baez (vocal & guitar). This is called a sacrilegious lullaby in D minor. That's the D minor, ah ha. Right. This is a love song and it's called The Gates Of Eden. There are…. Hey anything you say! Hope I never have to make a living. This is called It's Alright Ma It's Life An Life Only. Yes it's a very funny song. This is about the people they say they've never seen you. I'm sure every body has met somebody that swears they've never seen them Hi! I never saw him! (strums) Oh God! Here's the second verse of it. (strums) Does anybody know the first verse of this song. (From crowd "I can't understand") Oh this is the same song, same song only started now. 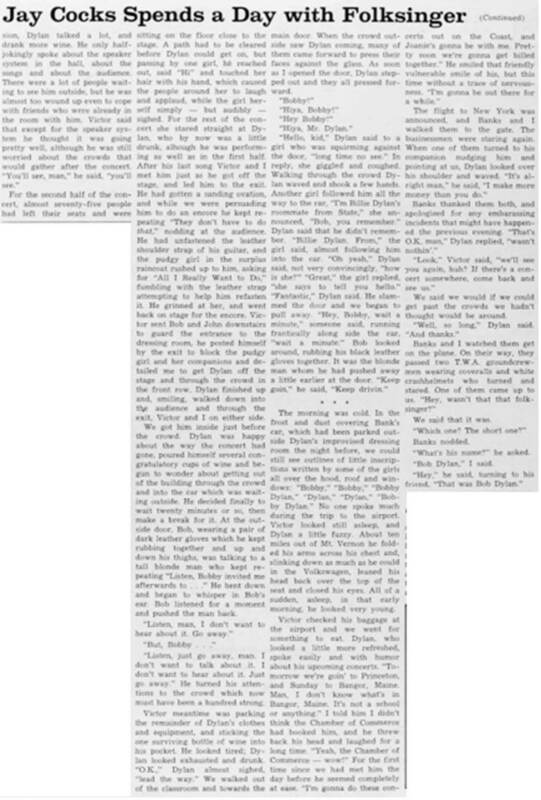 This is a true story right out of the newspapers again. Just the words have been changed around. It's like conversation really. More? Can't hear you. (cries for Mary Had A Little Lamb) God, did I record that? Mary Had A Little Lamb. Is that a protest song? (before All I Really Want To Do). Released on The Bootleg Series Vol. 6: Live 1964: Concert At Philharmonic Hall, Columbia Legacy 512358 2, 29 March 2004.
available on COLUMBIA RECORDING STUDIO'S REFERENCE RECORDINGS. 6, 7, 9-11, 15 available on COLUMBIA RECORDING STUDIO'S REFERENCE RECORDINGS. 15 released on JOAN BAEZ: RARE, LIVE & CLASSIC, Vanguard VCD3-125/27, 31 August 1993. 6, 7, 9-11, 15 started circulating 1980. Mono audience and stereo PA recording, 106 minutes. Session info created 15 January 2019. Session info created 17 January 2019. Brady J. Leyser: Live in Canada, A Concert History. Anthony Ferry: The Toronto Star 14th. November. Marvin Schiff: The Globe & Mail 14th. November. Barrie Hale: The Toronto Telegram 14th. November. Session info created 20 January 2019. 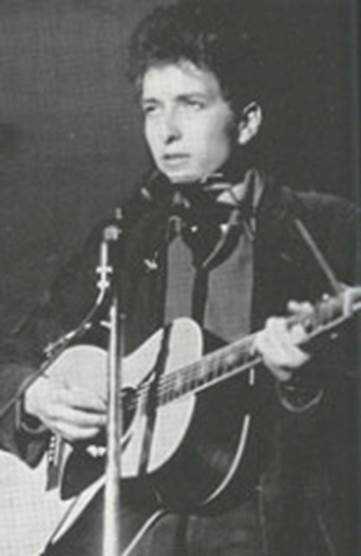 Bob Dylan (guitar, vocal, harmonica). Only two songs were performed. 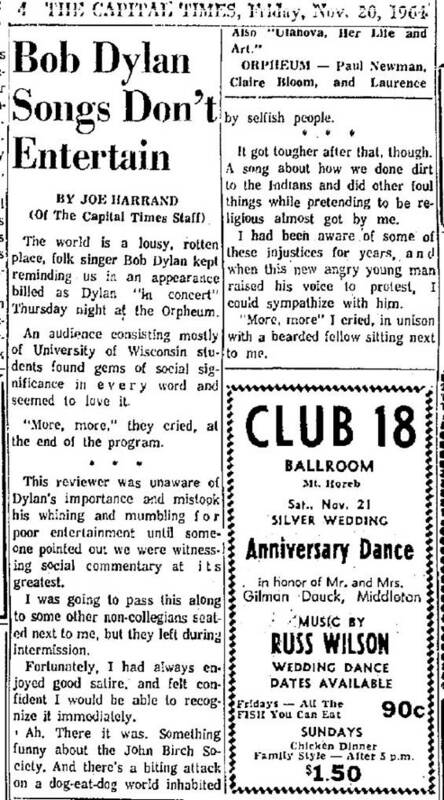 Dylan left the stage after the sound system broke down. ISIS Magazine #108. April-May 2003. ISIS Magazine #157. July-August 2011. Released on 50th ANNIVERSARY COLLECTION (1964), LP 9, 8 December 2014. Incomplete mono audience recording, 55 minutes. Session info updated 20 January 2019. 6 Joan Baez (guitar and vocal). Released on 50th ANNIVERSARY COLLECTION (1964), LP 8, side P, 8 December 2014. Incomplete mono audience recording, 30 minutes. This interview was never broadcast. Includes contributions from Victor Maimudes and Bob Neuwirth. Session info updated 21 January 2019.